I stepped outside and listened to the voicemail. 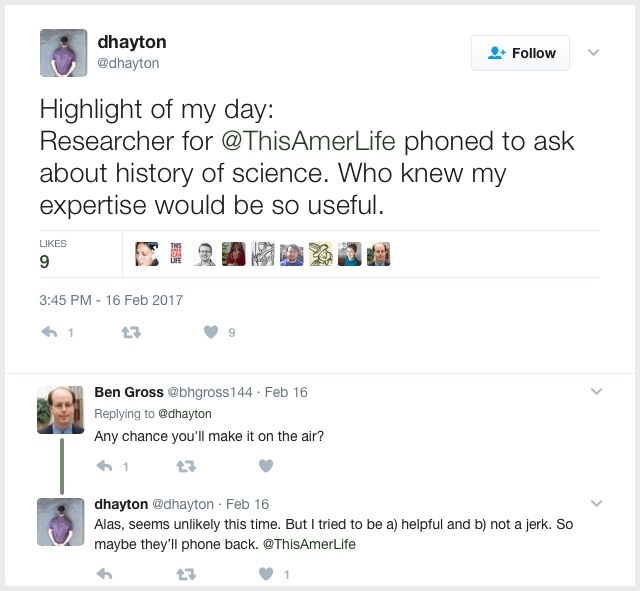 The person identified himself as a researcher for This American Life, asked if he had reached Darin Hayton, and wanted to ask about astrolabes. His message sounded urgent. I was intrigued. Why would anybody feel a pressing need to learn about astrolabes, at 5:30 on a Thursday evening? And why would that person not just turn to Wikipedia or some other on-line resource? So I decided to respond. 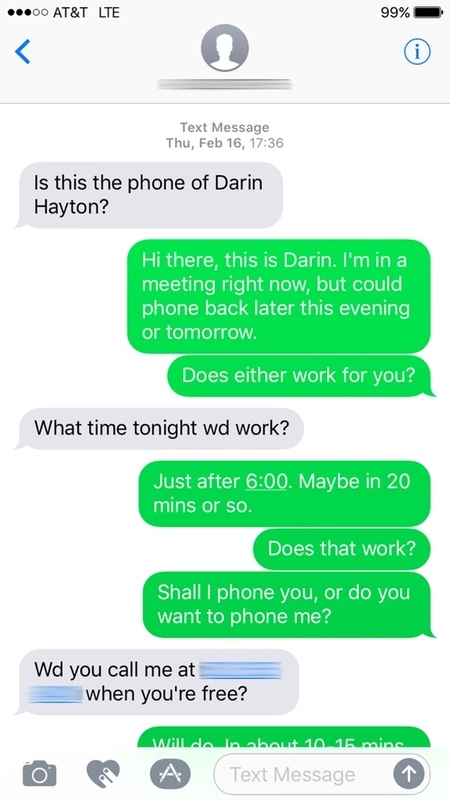 As I was still, at least physically, in a meeting, I texted rather than phoned and offered to call later that evening or the next morning. He asked that I call him as soon as I was free. Texting with the guy who turned out to be a researcher for This American Life. When I phoned he immediately started asking about astrolabes. He had clearly done some research on them but wanted to confirm what he had learned—e.g., Hipparchus had developed the mathematics but not an instrument; early instruments dated from the late 9th century; you could use it to tell time. He was particularly interested in developments introduced by 10th-century Islamic scholars. He asked about different innovations we might attribute to them and wanted to know how they improved the astrolabe. Most of the innovations he mentioned cannot easily or definitively be traced back to early Islamic instrument makers. We chatted for 10–15 minutes. As our conversation wound down, I tried to find out why he was so interested in astrolabes. He offered few details, saying only that he was doing research for an up-coming This American Life show on a man from Alabama who had studied astrolabes and had even built his own. He wouldn’t tell me the man’s name, but did mention that he had recently died. After we hung up I tweeted about my brush with fame. I am clearly a nerd since I think having This American Life phone me constitutes fame. I tweeted about my brush with fame—clearly I’m a nerd because I think talking to This American Life constitutes fame. Fifteen minutes or so later as I stood in my bathroom brushing my teeth, my phone rang again. Same guy confirming a couple points and asking if his formulation was correct. Something to the effect: the Greek astronomer Hipparchus developed the mathematics behind the astrolabe and 10th-century Islamic scholars refined it to time their daily prayers. Yes, I said, that’s fine. Because kids are talking about getting girls, or deer hunting, or football. Whereas I was interested in the astrolabe, sundials, projective geometry, new age music, climate change, and how to solve Rubik’s cube. BRIAN REED: The astrolabe looks kind of like a clock crossed with a compass. It’s a flat dial with a map of the night sky laid over it, and a pointer, or I guess a sight, attached on top of that. You pick a star in the sky, and aim the sight at it, twist the sky map until it aligns with the sight in a certain way. And then the dial shows you your direction, as well as the month, day, and time. It’s a beautiful, complex device. And as a kid, John longed to figure it out, to put himself inside the brains of the people who puzzled through the earliest versions—the Greek astronomer Hipparchus, who devised the mathematics behind it, or the 10th century Islamic scholars, who refined the invention to help them time their daily prayers. John wanted to go through what they had to go through to create an astrolabe. Which is why he made his own, designed specifically for the coordinates of this house. It hangs on the wall of his mother’s bedroom. That’s what he’s showing me, his astrolabe, when Skyler Goodson happens to walk in the front door. When I heard this, I immediately recalled the man who had phoned six weeks earlier asking about astrolabes. There, in Brian Reed’s brief description, was the final version of what the man on the phone had crafted. It turns out that the man on the phone had been doing research for S•Town. Thanks to S•Town and John B. McLemore, astrolabes are enjoying their 15 minutes of fame. Reddit pages on S•Town have astrolabe discussions. Websites promise to show you “How to Build an Astrolabe Like John B. McLemore From ‘S- Town’.” S•Town fans are turning up in museums asking to see astrolabes. 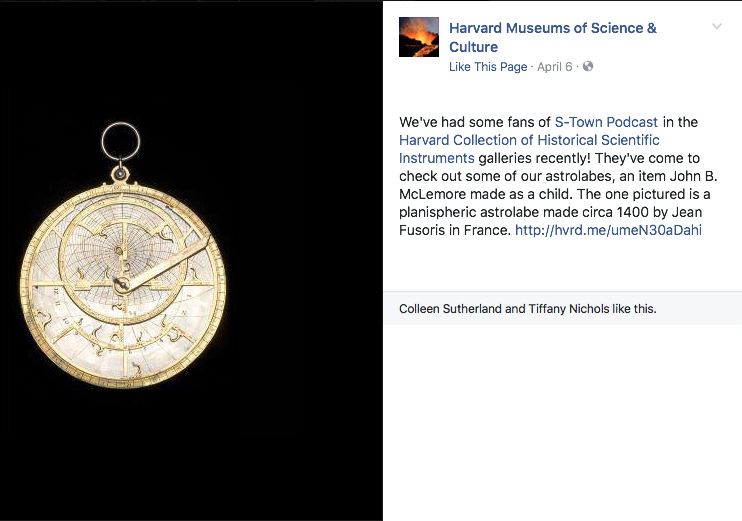 Visitors to Harvard’s museum are S•Town fans and want to see astrolabes. Hey This American Life, perhaps you would like to do a whole show on astrolabes. While not as eccentric as John B. McLemore, I have built my own astrolabe, I know its history better than most, and I’m available. Your researcher/fact checker has my number. Have him give me a call.